According to the Merriam Webster Dictionary, “atrophy” is defined as a decrease in size or wasting away of a body part or tissue. In other words, if you don’t use it, you lose it. Lupe & Brian: Welcome to another episode of Sjogren’s Strong. This is Lupe. And my name is Brian. Lupe: Today we want to discuss atrophy of the muscles and the mind. 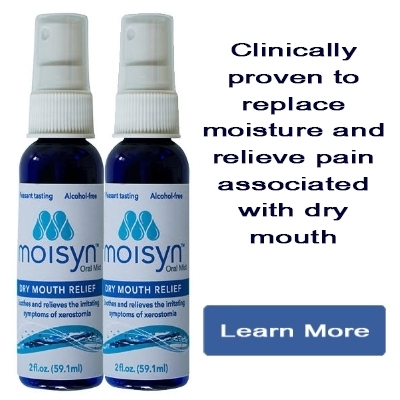 Having had Sjogren’s for 10 years now, I’ve not only had good days and bad days. I’ve also had good months and bad months. Brian: At the end of every year, Lupe and I evaluate that year. And we discuss good’s, bad’s, what worked, what didn’t. We really wanted to share what we’ve learned over the last few years. Now being human, sometimes we don’t even take our own advice, but most of the times we do. Especially when it comes to physical activity and strengthening the mind. Lupe: We understand everybody’s body is different and responds differently. By no means are we trying to call anyone lazy in this episode. Brian: But we want to encourage people to push themselves. It’s not always easy. It’s not always fun. But if you can get up and go to the restroom, when you need to go to the restroom, you can take an extra lap around the house. 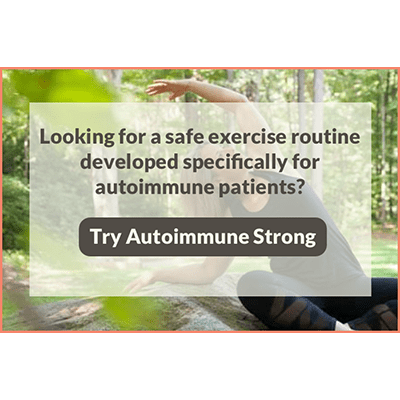 And just by that little gesture, you’re going to strengthen your legs, you’re moving your body, you’re using muscles, instead of just going to the restroom and back to the couch. Lupe: For example, when we go to the grocery store, supermarket, Walmart, Target, you name it, wherever it is you go. And let’s say we only want a couple of apples. Instead of going directly towards the apples, which are right as you enter the store, we actually go the opposite direction. And we walk the entire store. In doing so, we walk extra steps. Brian: When we’re driving to the store, we park pretty far from the entrance and A, it’s easier to find parking. Because everybody wants to park as close as possible, but it forces us to walk a little farther. These little tiny things that we do, we’re pushing our body. We’re taking more steps. We’re burning more calories. We’re utilizing muscle just a little bit longer. Lupe: At work, when I print an email and I have to go grab it, the printer is actually like five steps away from where I sit. But I actually go the opposite direction and I walk… I have to take like maybe 30 extra steps, if I walk the opposite direction. But again, that’s extra steps. Brian: So, we started the exercise routine, Autoimmune Strong and one of the things we were instructed to do is called short foot. And it’s funny how simple it is to do short foot and if you’re not familiar with it, with your feet flat on the floor, you just kind of push your big toe down. And that shortens the length of your entire foot. But you’re utilizing muscles in your feet that are very important for balance. Brian: And I find myself at the end of the day, because I’ve done this, you know, I try to do 10 reps again every time I think about it. And it’s pretty easy to do. You scrunch your foot, you hold it for a count of 10, you let go 10, so on and so forth. But at the end of the day, my feet will actually feel a little sore. Brian: Lupe you’re still doing leg raises at your desk, correct? Lupe: That’s correct. And I tried to do that as often as I can. Which is probably most of the day because I’m usually sitting at my desk for 8-9 hours a day. And I also, if I’m going to go to the fax machine, if I’m going to go to the bathroom or just every 10, 15 minutes, I tried to get up and stretch my back, stretch my neck, and you know, all those little things help. Brian: These little things add up as the day progresses. Remember you’re strengthening your body and you should feel, over time, less and less fatigued because your body stronger. Lupe: And you also have to stimulate your brain. For example, you could do Sudoku, crossword puzzles. Brian: Even a simple game of words with friends, that app on your phone. Lupe: There’s a lot of apps on your phone that you could download. And you have crossword puzzles and just all kinds of things. Brian: In this brain stimulation is obviously going to take your mind off fatigue or your mind off an ache or a pain. For example, Lupe just started a class. Lupe: I’m so excited to share this with you guys. I signed up for a class last week. And it’s something that I’m really interested in. It really intrigues me. And I find myself wanting to just dive into it. And I’m at work, I’m thinking about my class. I can’t wait to get home and just jump into doing my homework. It’s helped my mind. Brian: And the weird thing is it’s keeping her mind off the pains and the aches. Some days she would come home from work, you know, 5:00 we’d hang out, exercise little bit, run through some Autoimmune Strong, eat dinner, clean the kitchen, and she might be down and out, 7PM. Done for the day. Brian: But now having her mind focused on accomplishing these tasks that are assigned to her in the class, she’s up until 10-10:30 doing homework, organizing notes, reading required materials. And it’s really cool for me to see her motivated. And I don’t want to say distracted from Sjogren’s, but in all reality, it’s a distraction from Sjogren’s. And you’ve got something to do other than sit there and take a nap. Brian: So again, encouraging you to get up, walk, move around, find something to do to stimulate your mind. Is what this show is about. Lupe: Last week, like I said, I signed up last week. The second day of school I left work, I went straight to school. I went to the library, I walked around, I was so excited. I encourage everybody to find something you’re passionate about because you’re going to get excited about it. Brian: So, this is where I’m going to get a little militant. Some of you are aware, I spent time in the Marine Corps. And one thing I learned when it comes to physical exertion, the mind is the thing that gives up long before the body will. And when I was in, serving, I could walk five more miles, than I thought I could. And the crazy thing is once you do that and you accomplish that, wow, I just hiked 30 miles with 70 pounds on my back. Brian: The next time you have a 20 mile hike, it’s like, yeah, whatever. No biggie because you’ve done 30. And I think we can equate the same when we’ve done some peaks of local mountains around here. Brian: We hiked Mount Baldy. It’s the tallest peak in Los Angeles County, California, I don’t know, seven months later. It’s like, yeah, let’s go climb this mountain. No training, no preparation for it, but we drove out to the trail head and we hiked and peaked Saddleback, and it was tough. It was hard, but in the back of our minds, it’s not as tall as Baldy was, so of course we can do it. So we kept going and we did it. Lupe: And it’s just a beautiful feeling when you finally peak. And you get this beautiful view and you feel accomplished. Brian: That’s why we want you to challenge yourself. Push yourself a little farther. We’re not telling you to go climb a mountain. We’re not telling you that, you know, doing short foot at your desk is going to make you a bodybuilder. But push yourself and if you push yourself just one step farther, 10 steps farther a week, week after week after week, you’re going to get to a place to where it’s not as daunting as you thought it once was. Lupe: Start off with five minutes. Five minutes today. Tomorrow maybe you could increase it to seven. By the end of the week, you might be doing 20 minutes, maybe even half an hour. It’s the small wins. Brian: And it is the small wins. And we encourage you to find those things where you can chalk up that small win. Whether it be, I got up and walked around the block today. Or I got up and I walked five miles today. Brian: Wherever your fitness level is and your capability is, that’s cool. But build upon that. Walk a block and a half, walk five and a half miles. Push yourself to go a little farther or a little faster each and every time you set out to accomplish something. Brian: And yes, we understand it’s tough, but if you don’t attempt it, you won’t accomplish it. Lupe: You’re going to start feeling a little bit better, a little bit stronger. Every day, push yourself a little bit more. The first day, don’t do too much to where you’re going to be so sore the following day that you’re going to quit. So, baby steps. Remember a little bit at a time. Brian: If you’re looking for a little encouragement along the way, along finding something you’re passionate about or pushing your body a little bit farther. Or utilizing some muscles you normally don’t use. 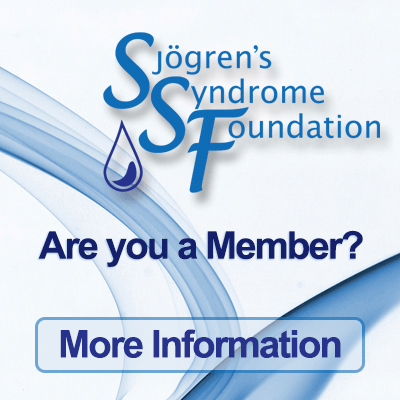 Join us on Living Sjogren’s Strong. It’s a Facebook Group. It’s a closed community. You’ve got to answer a couple of questions and we will allow access into this group. But this is a place where we’re bouncing ideas and comments and concerns, off each other to motivate each other. 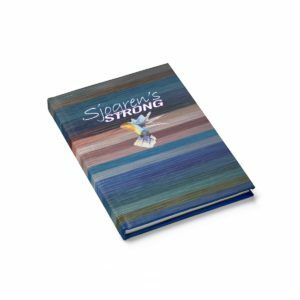 To push ourselves to be a little stronger, a little faster, and live a little better with Sjogren’s Syndrome. Brian: Listen, I know it’s tough some days, if not most days. But I encourage you, please take baby steps and start moving your body. We’ve heard it time and time again, if you don’t use it, you lose it. Lupe: If you’ve ever broken an arm or leg, you can relate. When it comes out of the cast, your muscle is smaller and weak. Why? Because you haven’t used it in months. So again, start using what you have while you still can. New Speaker: Challenge yourself. Five more minutes of walking. Read one more page before you put the book down. New Speaker: Take simple steps every day to push yourself. If you want, nobody else will. 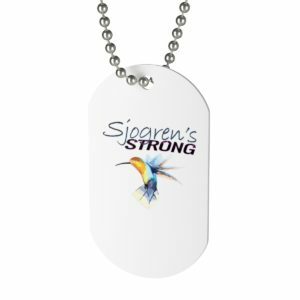 New Speaker: Let’s live Sjogren’s Strong together. New Speaker: Until next time, SIP CONSTANTLY AND STAY HYDRATED.